I don’t know if some of you were like me as a kid, but I loved all the major sports—especially hockey, baseball and football. And one of the things I looked forward to most, depending on the time of year, was heading into the city nearest me (for me that was Windsor, Ontario) and checking out the magazine stand at the nearest pharmacy store that carried what I was looking for. I was always disappointed when the new annual issue wasn’t in yet, and thrilled when it was finally there, and I could get my hands on a fresh, new copy. In baseball, it was usually “Street and Smiths”, if I’m remembering correctly. The magazine was usually available in my part of the world in late February or early March, just as spring training was really getting underway. That special baseball issue in particular warmed my heart and made me feel like spring was just around the corner. For my football fix, it was usually middle or a little later in July when the annual NFL pre-season “preview” publications would hit the stands. You have to understand things were so completely different back in those days. We didn't have all-sports radio and TV stations and minute-by-minute updates. You could go quite a while without worthwhile "out of town" sports news. (In my case, that was anything other than the "local" Detroit teams- the Wings, Lions and Tigers. I didn't root for any of those teams, so I craved any non-Detroit information that I could finally get my hands on.) So it was a huge thrill whenever I got my copy of magazines whose names escape me now. If I was feeling particularly flush as a young teenager in the late ‘60s (or if my Dad was feeling especially generous—the two were generally linked because Dad never made a lot of money) I would afford myself two different preview publications. What a treat it was to compare what various writers were saying about players and teams I liked. 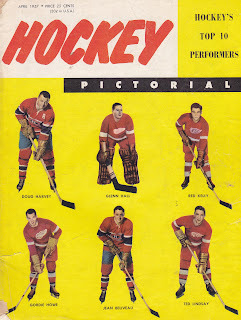 I’m sure I’m forgetting the names of some of the other really good old-time magazines in hockey and the other sports, but my point is mostly that it was so neat, such a huge thrill, to get my hands on a pre-season “prospectus”. It was a blast to read about the off-season changes and what those sports “experts” were predicting about the coming season in the various sports. This leads me to the present, and the fact that I recently enjoyed the opportunity to play a very tiny role in helping with the publication of a Maple Leaf preview publication. Alec Brownscombe and his excellent team (which includes, if I’m not mistaken, a wide range of hockey analysts, scouts and writers from various outlets, including The Leafs Nation, Pension Plan Puppets and his own outstanding site, Maple Leaf Hot Stove) developed the Leaf-specific annual again this year. Interestingly, it is now published by Lindy’s, a popular sports magazine that covers all the major sports. To my knowledge I’m not getting a “bonus” for promoting this, so I don’t feel self-serving in mentioning the magazine! If you’re a Leaf supporter or just love hockey and appreciate an extensive pre-season look heading into what we hope will be a 2012-’13 NHL season, you may well enjoy the publication. This issue is called Lindy’s Sports “in the Rink” Maple Leafs Annual. (Click on the Lindy's link if you'd like to read about their publications...) It can be ordered online at what looks to be (by today’s high-priced standards for everything, at least- I think I used to pay 75 cents or a dollar for these kinds of magazines back in the late ‘60s, but maybe my memory is off again….) a reasonable price for a specialized and well put together “all about the Leafs” effort. If you’re interested, here is a link. While we’re on the subject, let me know if there were hockey magazines you used to enjoy when you were younger—and life was simpler! Absolutely JB- Hockey Digest and the olden-days Hockey News "newspaper". I think I subscribed to both at one point! I used to read The Hockey News newspaper cover to cover. I found their AHL coverage particularly good as it provided insight re the NHL callups that were made from Rochester to the Leafs. I also remember reading lots about the careers of players from other AHL teams like Don Cherry (Hershey) and Johnny Bower (Cleveland). I think my Dad brought home a copy one day and I was hooked. I became an annual subscriber for a number of years using my paper route money. (so it wasn't all that expensive)! No question, Ed, The Hockey News covered the sport like nothing else did or could in those olden days, including, as you mention, what was going on in the minors.